No more forgetting to turn the lights out when you leave the house – Houzetek smart wall switch can do it for you. As a key part of smart home system, smart light switch just a subtle existence, but it masters the lifeblood of the whole home due to its ability to make ordinary household appliances become intelligent. →The life of remote control, it’s up to you. Want to use voice command to control the lights? Work with Alexa and Google Home, achieving voice control by this wifi wall switch is no problem. When your hands are full, just ask, “Alexa, turn on the light”. Plus, The Ewelink app allows you to check real-time on / off state of your lights and fixtures and turn on / off reasonably whenever you want wherever you are. There is a small LED at the top of the switch which enables you find it in the dark easily- although it’s not so bright as to disturb your sleep. Step 2: Plug the wifi smart switch into any outlet. ❤Provide longer warranty period, if the products have quality problems, we accept replace or return unconditionally within 2 years. ❤To meet our customers needs, Houzetek always keep on improving and updating the smart switch. 【Voice Control & Remote Control】Compatible with Alexa & Google Home, you can control your lights on or off with your Voice. 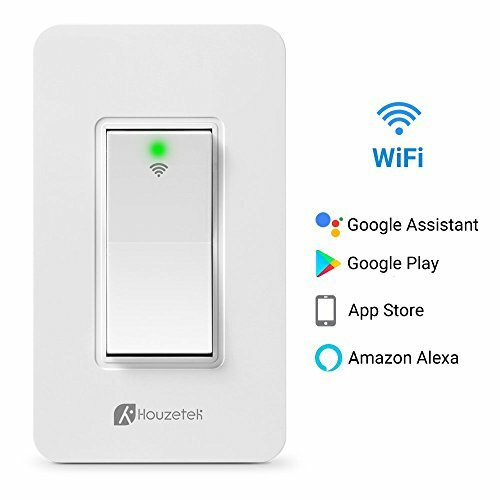 When paired with Amazon Alexa, Houzetek Light Switch gives you hands-free Voice Control over your lights. Just download eWeLink APP, you can remote control the switch. Turn on/off devices whenever you want and wherever you are. 【Support Multiple Devices】The app allows you to add as many smart plugs as you’d like to keep track of multiple appliances. Assign a name to each smart wall switch and make a voice command by name. 【Scheduling & Energy-Saving】The Daily Timer allows you to create schedules to automate your home electronics at anytime anywhere, saving your energy bills effectively. 【Wi-Fi Connection & No Hub Required】The control of intelligent switch has no limitation of distance. It can cover the living room, bedroom, bathroom, balcony and so on without pressure. As long as you can connect to wifi, you can achieve remote control switch. Since it works over WiFi, it doesn’t require any extra hubs or hardware to get started, so just install, set up via the eWeLink app, and use. This is smart living made simple. 【Security Protection & Perfect Afterservice】Made of ABS material, high-temperature resistant, and fire retardant, it’s quite safe for use. 30 days return without artificial damage and 24 hours service online.